Two Americans go adventuring in Neverland in this continuation of the famous Barrie classic. Clover and Fergus, two white children from San Diego, are spending three weeks in London with grandparents whom they have never met. As they struggle to settle into a strange place, Fergus is intrigued by sightings of a mysterious boy outside of their sixth-floor nursery window. A talk with their grandmother reveals that they are the descendants of Wendy—she is Margaret from the famous novel’s conclusion—and that Peter’s appearance means that he wants to take them on an adventure. 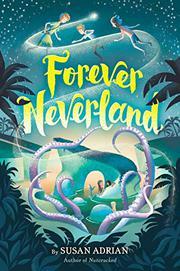 Neverland is everything that the siblings could want, until mermaids start mysteriously disappearing. Adrian does an exemplary job of creating complex and compelling characters out of the sibling protagonists—who alternate narration duties—so that readers are thoroughly invested in their journeys before Peter whisks them away. Fergus’ autism is deftly woven into the narrative and the siblings’ relationship. Clover, used to mothering her younger brother, struggles to stop worrying in Neverland, while Fergus, loving the freedom he finds there, fears that he will be judged. Two welcome and notable changes to the original Neverland mythos are the inclusion of female Lost Boys—the group as a whole alternates the monikers “Lost Boys and “Lost Girls”—as well as a racially diverse cast of supporting characters; Barrie’s Indians do not figure in the plot and indeed are not mentioned at all. A list of books and websites on autism is appended.